I like to daydream about the future. Ross Dawson is one of many futurists who make a living thinking about the future: studying global trends, examining growing technologies, and then helping organizations prepare for the world in which their current customers will eventually be living and working. 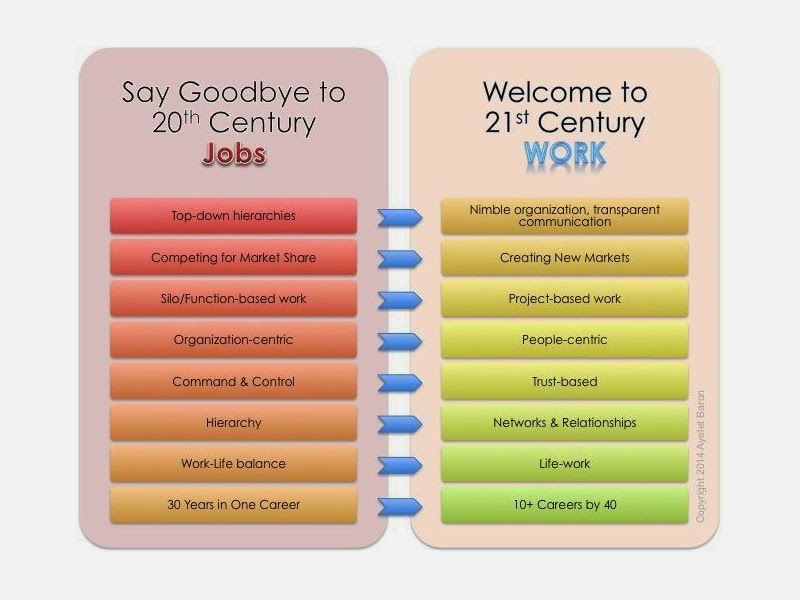 Dawson's "The Future of Work" framework released in September 2012 offers some of his insights into what the world of work might look like in 2025 and refers to the key drivers that will drive that change. There have been and will be many articles on what work will look like and how technology is changing it. TIME did a whole spread on the new work order. Forbes has published several articles including "The Future of Work (and Life) is Conscientiousness," "10 Ways Millennials Are Creating the Future of Work," and "Defining the Future of Work." Two key things are consistent: technology and collaboration. What also seems to be consistent is that work will increasingly focus on what you do, not where you do it. In other words, in our increasingly global society and with a wide range of technological offerings that make it easier to connect, the work place is less important than the work. On the other hand, even millennials are mindful of the need to balance the power of technology with the importance of all other soft skills. So I thought more about these articles and the insights of futurists as I considered the infographic on the 10 most important work skills for 2020: sense making, social intelligence, novel and adaptive thinking, cross cultural competency, computational thinking, new media literacy, transdisciplinary, design mindset, cognitive load management, and virtual collaboration. Many of these are somewhat self-explanatory; the infographic does a good job of providing some context and additional information. I don't think, though, that too many of these are really new. A lot of forward-thinking companies already expect these skills from their employees even if they don't use these terms. What might be different is that the expectations are coming from across work place disciplines. It used to be that certain skills existed only in some work place disciplines; that is, some skills required in the financial domain might not be required in manufacturing. Because of technology, things can change with some degree of rapidity in the work place. Because of globalization and technology, things can change fairly dramatically and quickly. I think a skill that's missing is the ability to determine what is real change and what is going to flame out after it's gotten it's 15 minutes of fame in social media. Because there is so much potential for change and because social media enables the ridiculous and the sublime to go viral, organizations could exhaust themselves chasing after whatever might be the Next Big Thing. So knowing how to use those important work skills intelligently and with a clear understanding of the vision of the organization may be even more important. Ayelet Baron is another futurist. Her ideas about the future of work can be found here. She reminds us to think about the work force and who will make up the preponderance of the work force in a decade or so. She reminds us of the importance of those in leadership to be thinking now, and I mean RIGHT NOW, about their organization's core competencies and how the organization needs to prepare to adapt over the next few years to be ready not only for the customer expectations of work, but the work force's expectations of work. My dissertation chair, Dr. Dwight Allen, is a futurist. People would say of Dwight that he didn't think outside of the box because he didn't know there was a box. It is my considered opinion that high school and college/university educators need to use some of these resources as they reflect on the design of their syllabi and lesson plans for the upcoming school year. In fact, elementary and middle school teachers should be aware of these resources. 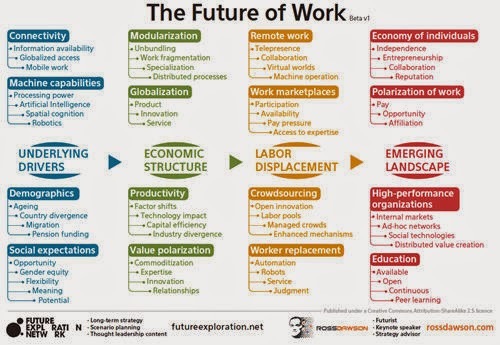 In fact, superintendents and principals should ensure there are periodic meetings of K-12 teachers to discuss implications of the future of work trends (not fads) and how those implications might inform their students' learning. And then when teachers discover ways to integrate problem-based learning, action research, maker/tinkerer/inventor learning, competency-based learning, and passion-based learning, they will quickly see how easy it can be to enable their students to begin to develop or to refine the very skills they may need for their futures. Thank you, ISTE. . .